October 19th may seem like an odd time for a back to school post, but tomorrow is my first day of classes for my graduate degree at West Liberty University. I have to admit, I am terrified. 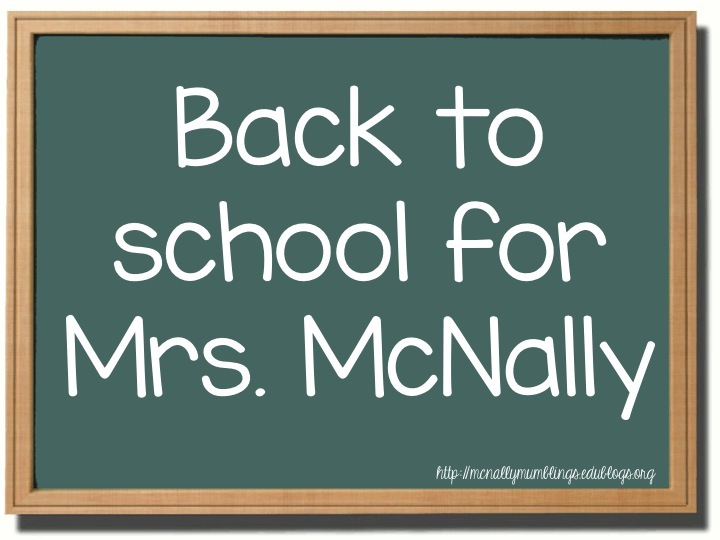 Nearly every day I talk to my students about preparing them for college or “life after McNally.” I pride myself at knowing where I need to get my seniors to be “ready,” but am I ready? So much has changed since the last time I was going back to school as a student. I graduated high school in 2004. Bethany wasn’t even one of the few schools that had connected into the Facebook network yet. My mom took care of all my financial aid and registration. I had a trusty Nokia cell phone (still arguably the most durable mobile ever made), but there was no cell phone service at Bethany. I had a calling card to call home and talk to my parents. I had a laptop that I bought with my graduation party money, but wireless at Bethany was spotty at best and nonexistent at worst. I was super prepared with my trendy bedding, my reliable shower caddy, and my freshman lanyard. I was nervous about making friends and getting along with my roommate. I was determined to make a good impression on the sorority I wanted to join. I was scared I wouldn’t be smart enough to pass my classes, and I was actually a broadcasting major. Looking back, I was a baby. Getting ready for college this time, I’m not worried about my bedding and finding the perfect roomie, but I am still nervous! Will I be the oldest one in class? Will everyone laugh and think I’m a nerd when I bust out my laptop to take notes? Will I be able to keep up while still being a full time teacher and full time mom to nine month old twins? Will I regret my decision to go back to school? Will I be enjoy my classes? Will I look up to my professors? Will my professors like me? Will I know any of my classmates? Will I like any of my classmates? Will I get straight A’s? Although many of my worries are different this time, there is a similarity: excitement. I am so excited to start this new chapter of my life. I am so excited to reconnect educationally. One of my favorite professors from Bethany is the Dean of the Education Department at West Liberty. I can’t wait to work with the professors she has brought into her program. I know that this experience is going to make me a better teacher as I learn new ways to connect with my students. I am excited to learn! I know, huge nerd, but it is the truth. I want to hear viewpoints that differ from my own and broaden my horizons and try new and innovative strategies. I want to connect with educators outside of my district and collaborate to allow myself to become the best teacher I can be. Standby, friends. I’m sure you will be getting lots of posts based upon the information I am picking up in my classes. Wish me luck!